You will want to make it. You will be proud to partake of it, even. 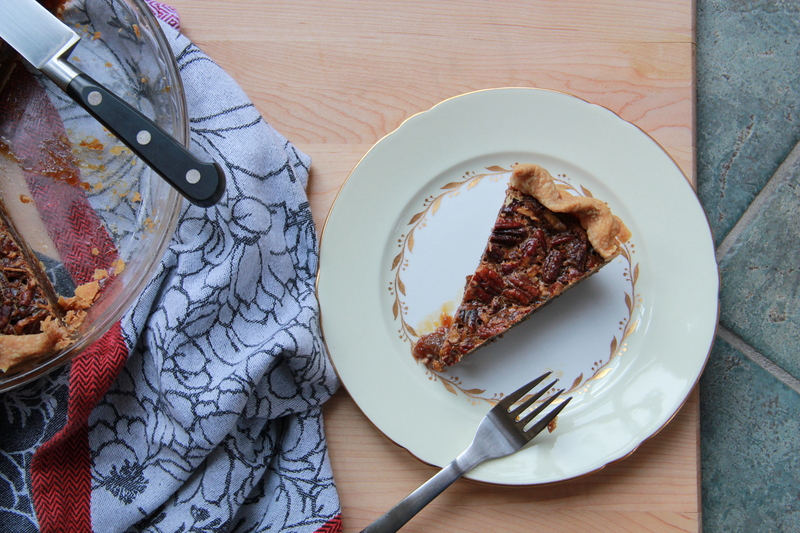 It’s rich and toasty, sweetly mapled, faintly caramel-ish – it is deep, this pecan pie. Deep in the maple/brown sugar/molasses, complex-and-nuanced sort of way, not in the literal depth sort of way. You know. It’s like, deep, man. I ate this pie straight out of the dish while the rest of my family was too ill for solid food at Thanksgiving. I sat at my parents’ kitchen counter with a fork and an entire pie. And the crossword. I sat there for awhile. Just how long, well – there’s no way of knowing, really. Does it matter? It was gleefully guilt-inducing. Sorry I’m definitely not sorry. 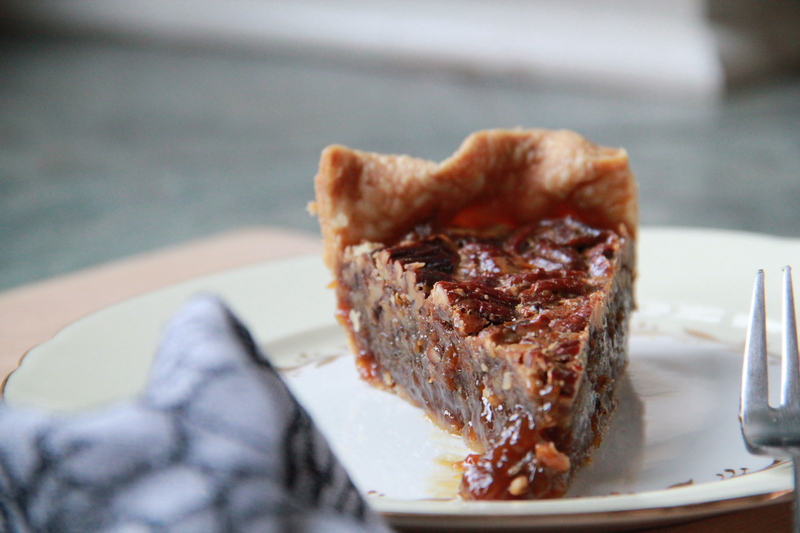 I used to make pecan pie with dark corn syrup; it always came out sickly sweet, a one-note tooth-coating sugar bomb. Never again. As far as I’m concerned, this rich and caramel-y revelation is the future of all pecan pie. It is the place where pecans are happiest, I’m sure. I’ve got plans to make it again over Christmas. And this time, I might even share it. First, toast the pecans: spread the roughly chopped pecans on a rimmed baking sheet and place them in the oven. They’ll toast quickly in there, so keep an eye on them as you gather the rest of your ingredients. As soon as you can smell them, they’ll probably be good and toasty – remove them from the oven and allow to cool. Unwrap your homemade or store bought pie crust and, on a well-floured surface, roll out the dough into a large circle, about 1/8- to 1/4-inch thick. Carefully transfer your rolled dough to a 9-inch pie dish, gently pressing the dough into the dish and crimping the edges to your liking. Set the unbaked pie crust in the fridge to chill while you prepare the filling. To prepare the filling, stir syrup, sugar, cream and molasses together in a small or medium saucepan. Set the saucepan over medium heat, and stir occasionally until sugar dissolves, about 5 minutes. Remove from heat and whisk butter and salt into syrup mixture until well combined. Allow the mixture to cool to room temperature before whisking in egg yolks. Remove your prepared pie crust from the refrigerator. 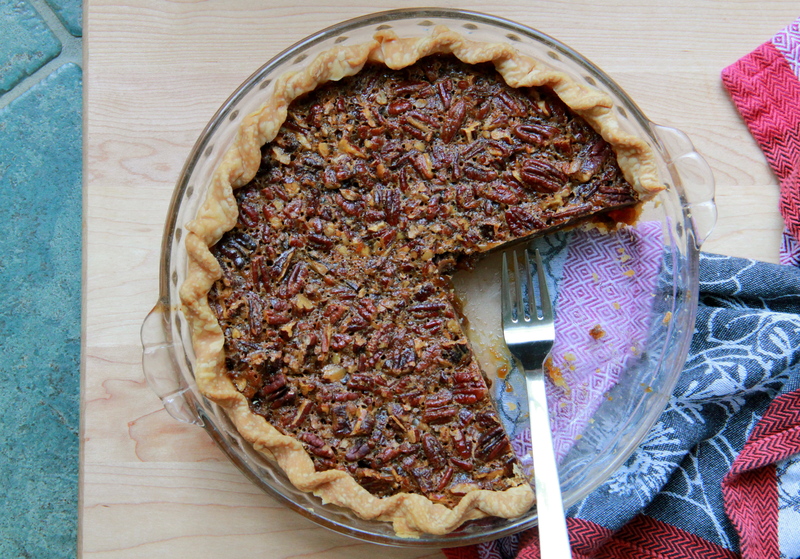 Scatter toasted pecans evenly in your pie shell, then pour the filling atop pecans. Carefully place pie in the oven and then immediately reduce oven temperature to 325 degrees. Bake pie until the center of the filling jiggles only slightly when gently shaken, 45 minutes to 1 hour. 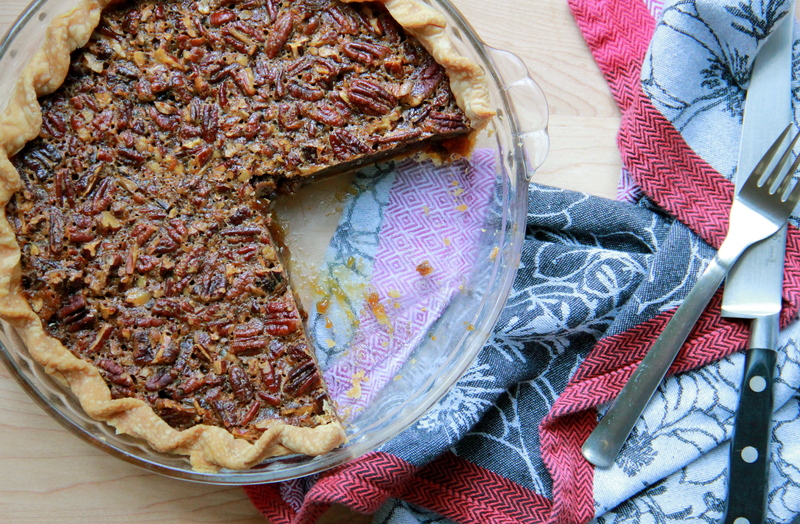 Let pecan pie cool to room temperature before placing it in the oven to set up, about 3 hours or up to a day. Serve pie slightly chilled or at room temperature, with lots of billowy whipped cream on top. This looks beautiful! I’m going to pin it on our America’s Test Kitchen Pinterest Board “From Your Kitchens.” Hope it tasted as good as it looks! How could you, I am a weak mortal! muahahaaa. all part of my master plan to take over the (pie) world. resistance is futile, Liz Bien! oh my stars. get in my face now, please, Pie. Yay! No corn syrup! Thank you for the recipe and thanks for the addition of molasses, which i love and have vowed to use more often in my recipes. Yay!! Thanks for the comment, Sandi! I dont even like pecan pie, and I loved this stuff. hello, i found you via food52… it looks great. quick question – last step: “Let pecan pie cool to room temperature before placing it in the FRIDGE (not oven) to set up, about 3 hours or up to a day” ? Yes, fridge is correct! After the pie bakes and cools, I like to let it rest in the fridge a few hours to firm up the filling completely. But you could probably get away with skipping this step if you like your pie a little gooey-er. Enjoy! I just know this recipe is outstanding, and can’t wait to try it. Gotta ax ya one little question: Some pecan pie lovers prefer a two-tiered pie, with custard on the bottom and a modest layer of pecans floating on top. 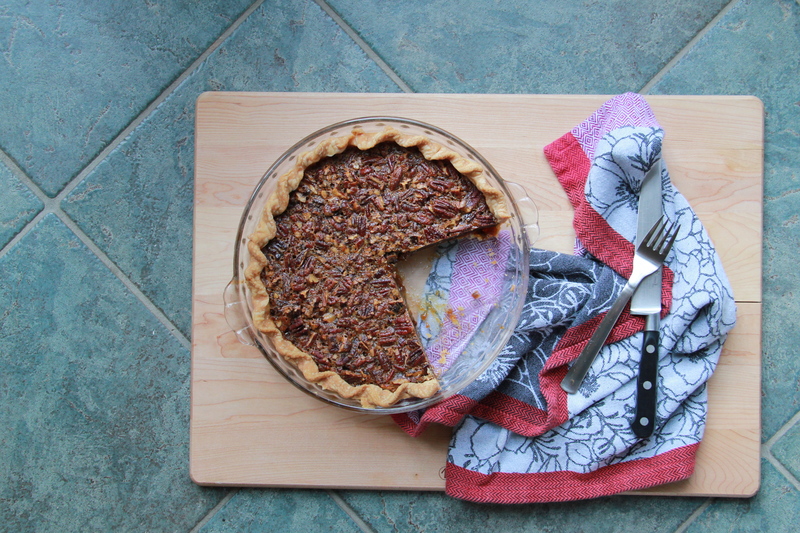 Others (like me) prefer pies filled with pecans, floor-to-ceiling. Hard to tell from the photo which type of pie this is. If the former, I might add additional half cup of pecans. Or would that be messing with perfection? Be honest. Good question! I totally feel ya on this. This recipe makes a pie that is almost filled with pecans — there’s only a very thin custard layer on the bottom. I think it’s a perfect ratio, but if you wanted to really fill ‘er up, I think adding an extra 1/4 cup nuts would do the trick. Let me know how it turns out! Thanks for your thoughts, Miz G. It seems only right to try a beloved recipe as written, so I won’t tinker with it first time out. The day may come when I decide to take a walk on the wild side and make a second pie with an additional 1/4 cup of pecans. If so, I’ll be sure to report back. Thanks again for the recipe, and for your help! a friend (in switzerland of all places) was just asking for a good pecan pie recipe. i’ll tell him to try this one!